Earn up to 3,645 reward points. Gorgeous looks and active electronics. 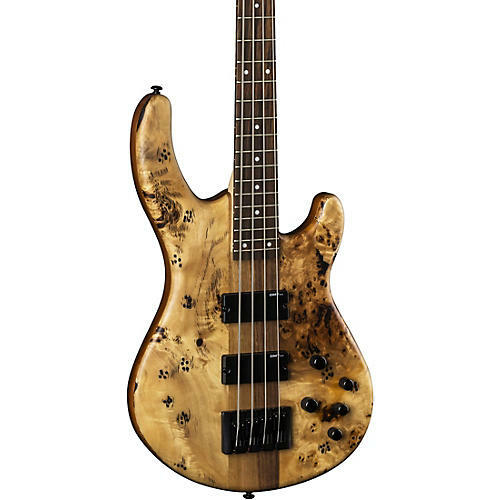 The Dean Edge Select Burled Poplar Bass takes fit and finish to a new level with choice tonewoods and electronics. It has a light mahogany body and a poplar burl top with maple center that's styled and contoured for comfort. The 34" scale maple neck is profiled to be fast playing and sleek feeling. A custom design neck joint and heel along with an asymmetrical 4-bolt pattern creates uninterrupted access all the way up the 2-octave Pau ferro fretboard. DMT OEM pickups deliver a clean low-end that cuts through the thickest mix. Black hardware features Grover mini tuners and an High-Mass bridge. Other cosmetic touches include pearl dot fingerboard markers and a beautiful satin finish. Case sold separately.